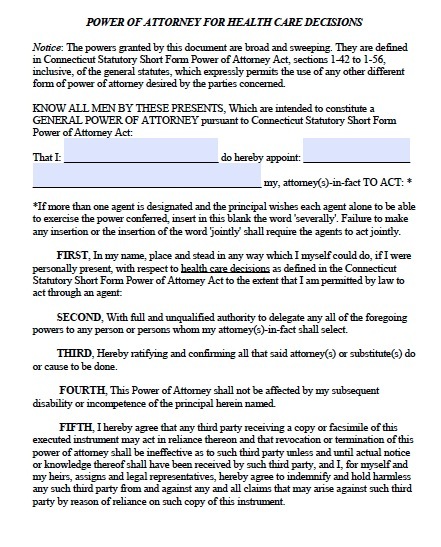 Use a power of attorney to decide the type of healthcare you will receive in the future in case you become incapable of making a decision yourself. This variation is called an advance health care directive, and it allows you to name someone as a healthcare representative, similar to an agent, to make healthcare decisions for you. The living will is a type of directive that specifies whether you want to receive life-supporting treatments, such as CPR and artificial respiration and nutrition, if you suffer from a permanent, terminal condition that will result in death after a short period without life support. For example, if you suffered a terrible car accident that caused a severe brain injury, this could result in death if your brain cannot make your lungs respire. The living will lets the principal note which treatments he would like in that type of situation, so he can choose all, none, or a combination. This is an important document to enact because otherwise family and doctors will have to decide how to treat you, and the result could vary widely from your wishes.